Sarah (Mandolfo) Corsino, 96, formerly of Kensington, widow of Paul A. Corsino, died Saturday night at Bel Air Manor, Newington. Born in New Britain, daughter of the late Angelo and the late Alfia (Barone) Mandolfo, she graduated from New Britain High School and from secretarial school and was employed at the May Company until her retirement. A member of St. Paul’s Church where she was a member of the Ladies Guild and was a member of The Red Hats. 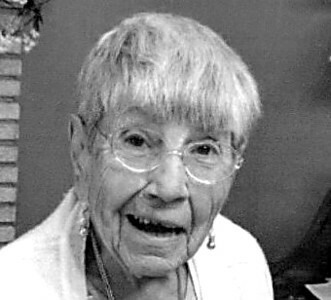 She loved cooking and gardening, and was an accomplished seamstress and an avid reader. She is survived by a son and daughter-in-law, Dennis and Eydie Corsino of Plainville, a daughter and son-in-law, Mary Ann and Timothy Grady of Berlin; four grandchildren, David Corsino, Daniel Corsino and his wife, Jessica, Catherine Griffin and her husband, Christopher, and Patrick Grady and his wife, Samantha; four great-grandchildren, Angela Lynn Corsino, Alison and Peter Grady, and Grace Griffin; and several nieces and nephews. Funeral services will be Thursday, at 9 a.m. from Porter’s Funeral Home, 111 Chamberlain Highway, Kensington, followed by a Funeral Liturgy at 10 a.m. at St. Paul’s Church on Alling Street. Burial will be in St. Mary Cemetery, New Britain. Friends and relatives are invited to call at the funeral home on Wednesday, from 4-7 p.m. In lieu of flowers, donations may be made to St. Paul’s Church, 467 Alling St., Kensington, CT 06037, or to the Berlin-Peck Memorial Library, 234 Kensington Road, Berlin, CT 06037. Directions to the funeral home can be found at www.portersfuneral.com . Posted in New Britain Herald, on Monday, 28 January 2019 18:53. Updated: Monday, 28 January 2019 18:56.